“God has truly blessed us,” said Fae. 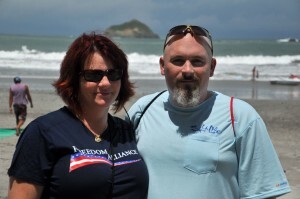 She and her husband Shawn, a medically retired Marine, recently traveled from North Carolina to the Costa Rican paradise, courtesy of Freedom Alliance and our generous donors, Gerald and Virginia Lindholm. Gunnery Sergeant Shawn suffered two major head injuries (including a traumatic brain injury, or TBI) during his 2005-2006 deployment to Iraq caused by separate explosions. It took two years to overcome speech difficulties as a result of the wounds, and he’s had to learn to walk without aid. It’s been a challenging few years for Shawn and Fae as he rehabilitated. 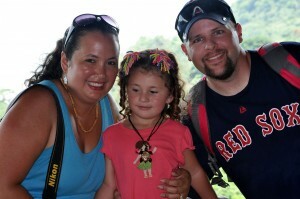 For Shawn, Fae, and the other guests, the dream was a Poppy’s Wish Heroes Vacation to Los Suenos Resort in Costa Rica. 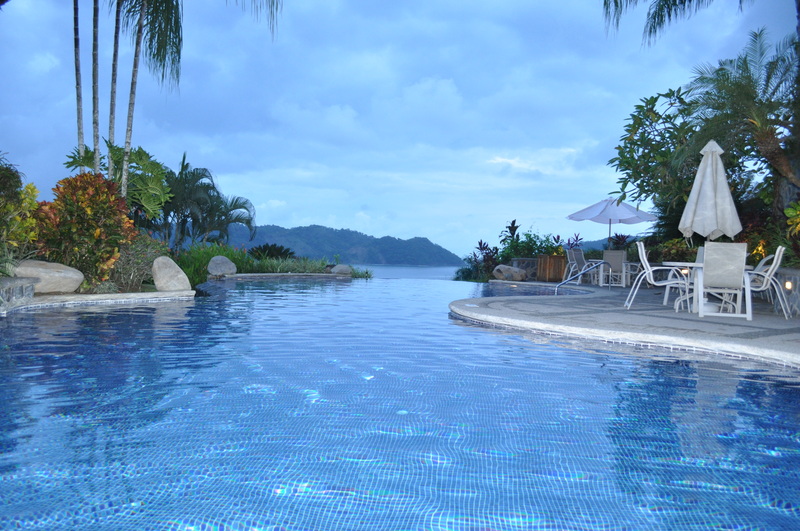 This vacation offered lush rainforests, exotic wildlife, gorgeous beaches and pools … and luxurious condos with amazing views of it all. Josh, his wife Emily, and daughter Madison joined us as well. Josh is legally blind after multiple TBIs and exposure to blasts in Afghanistan (2008 and 2010), which led to a detached retina after returning stateside. Although surgeons repaired the eye, his sight continues to weaken. He also suffers from pinched nerves in his foot, creating problems with balance. The third family belonged to Jeffrey, who was shot by friendly fire in Fallujah. He took shots in the head and leg, the latter injury threatening to take the appendage. (He got to keep his leg, but not without lasting damage.) The former injury left the young man in a coma for months. His sister, Kourtnee, stayed by his side until Jeffrey woke up and learned to walk and talk again (despite the doctors prediction that he never would). 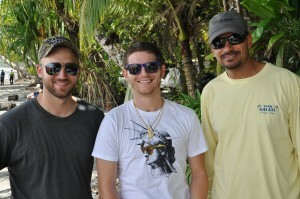 Jeffrey came to Costa Rica with Kourtnee, his mother Tammy, and step-father Tom. The first stop from the airport was the welcome party and barbecue around the pool, where the guests would meet their hosts, the Lindholms, and others involved in making this vacation flawless. Each sojourner was given a welcome package with a towel, water bottle, poncho, insect repellent, sunscreen, and a t-shirt. This started the week with a bang. There were everyday outings, including a trip to a local sanctuary for injured birds to be rehabilitated and released (this had special meaning for our wounded combat veterans). A drive out to Quepos garnered time for shopping, beach fun, and lunch in a US cargo plane (a relic of the Cold War) that was shot down nearly thirty years ago. During a riverboat ride in the mangroves, the Poppy’s Wish heroes fed bananas to wild monkeys, one of which even leapt into Fae’s lap! Two families opted for a zip-line tour over the rainforest canopy, while the other guests enjoyed the beach and pool. The Lindholms invited everyone out on their sizable yacht for a cruise to nearby Jaco for shopping, dinner, and gelato. (Tammy and Tom celebrated their 21st anniversary on this day.) The crocodile tour was a big hit as well. The going-away party at the end of the week was bittersweet. Gerald expressed his appreciation to our service members and recognized all the individuals who helped to with the vacation. It seemed that no one was ready for the vacation to end. Jeffrey’s family was candid about his close call and how fortunate that he was here to enjoy the vacation with them. Tammy remarked that she hadn’t seen her son so independent and outgoing before. “I’m in love with another country!” she exclaimed. Ditto, Tony. ’Til next time….